Many thanks to the team of Friends who turned out in the sunshine last Sunday afternoon. Part of the idea of having the entrance field partly wildflower means that when the high grasses are cut for the winter we don’t want to automatically collect the clippings. 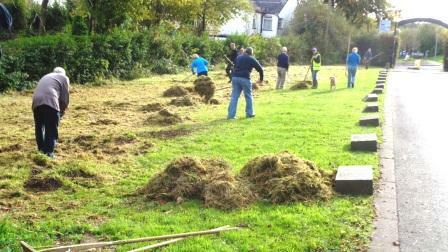 Instead we want the clippings to remain on the ground for a couple of weeks and then remove them by raking so that the agitation shakes the seeds into the cut grass to grow further next year.